Lake Nakuru National Park is competing with Amboseli as Kenya’s second most popular park (after Masai Mara National Reserve). It can be visited in a day tour from Nairobi, has beautiful scenery and plenty of wildlife. It’s main attraction, however, is the huge pink flamingo population, which has been called the biggest flamingo show on the planet. The park is rather small, 188 square kilometers of which a third is covered by the lake. 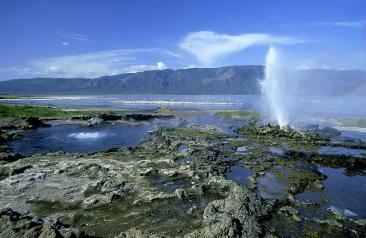 The lake is surrounded by acacia forests, rich grassland and rocky cliffs where lots of animals and birds reside. The variety in vegetation is huge, with 500 different plant species including the biggest euphorbia forest in Africa. From Baboon Cliff, you have a superb view over the park, especially in the few hours until sunset. The Lion Hill and Out Of Africa Hill are also great viewpoints. The Makalia Falls within the park are also worth visiting. The flamingo population is terrific to watch, but be warned that their presence is unpredictable. Once numbering between 1 and 2 million, the bulk of them disappeared in the 1960s and 70s after heavy fluctuation of the lake levels, through droughts replaced by heavy rainfalls. Many returned, to disappear again in the 1990s with further heavy fluctuations of the lake level. Since 2000 the flamingos have been returning, though their number isn’t up to the old level (yet), and they may move elsewhere again when conditions become worse. 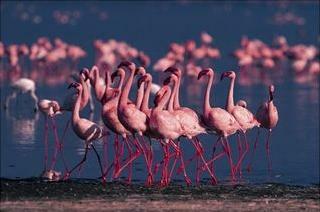 Apart from the flamingos, the lake is home to over 400 bird species, which makes for some great bird watching. Futhermore, the Lake Nakuru is waterbuck heaven. Because of the absence of natural enemies, the waterbuck population numbers in the thousands. There are also lots and lots of buffaloes and warthogs. Furthermore, leopards, zebras, dik-diks, ostriches and jackals can be seen, as well as elands and Thomson’s and Grant’s gazelles in the southern part of the park. The population of 25 white rhinos, brought in from elsewhere, is one of the biggest in Kenya. A herd of hippos can often be seen bathing in the lake and the park is also known for it’s large pythons. Elephants, however, are absent. The park is great for game viewing and bird watching. The park has various campsites and lodges, each ranging at different prices. Lake Nakuru Youth Hostel goes for double/single KSH 500/1200, while camping there will cost KSH 500, a campsite open to anyone regardless of age. At Lake Nakuru ‘special’ campsite, camping goes for $50 plus set-up fee of KSH 7500. The campsites are initially intimate wild spaces with no facilities, fences or security. Rangers usually use light night fires to deter the animals. Sarova Lion Hill Lodge is priced at $366/486 for a single/double. Lake Nakuru Lodge will cost $300/400. Flamingo Hill tented Camp per person starts at $195. The park has 2 public campsites (Backpackers’s Campsite and Makalia Falls Public Campsite); camping is $10 for adults and $5 for children per night. Throughout the park there are also many ‘special’ campsites with no facilities. Furthermore, there is youth hostel, a guesthouse, a mid-price lodge and 3 top-end lodges. The budget and mid-price places don’t provide any meals, so you’ll have to bring your own food. Walking in the park is not allowed. Park guards at the gate have been willing to help individual people without their own vehicle to join another group, but this is no guarantee. You can also negotiate with a taxi driver on the spot, which will cost you about $15 for a 3-hour drive after some hard negotiation. The park has it’s own airstrip for small aircraft, which is open for tourists. The park has 3 gates. The main gate is 2 kilometers south of Nakuru. Entry fees for non-Kenyans are $80 for adults, $40 for children (payment by smartcard only).